Hidden within the pristine islands of Vanuatu is a little island paradise Ratua Private Island.It offers a unique eco-lodge and authentic pacific experience combined with its charming character that makes this destination appealing to passionate adventurers and nature lovers.Staying in any of its rustic villa handcrafted from 200-year old Indonesian teak houses is a celebration in itself! Thirteen villas are spread in three villages; each is veiled with lush vegetation leading to its own private beach with breathtaking view of turquoise water. Guests are limited up to 38 to preserve its natural surroundings and to ensure utmost privacy. From Espiritu Santo mainland, a fun and refreshing 30 to 45-minute motorboat ride marks the beginning of an adventure of a lifetime. Upon arrival, warm smiles welcome all travellers while slowly immersing in the local culture. 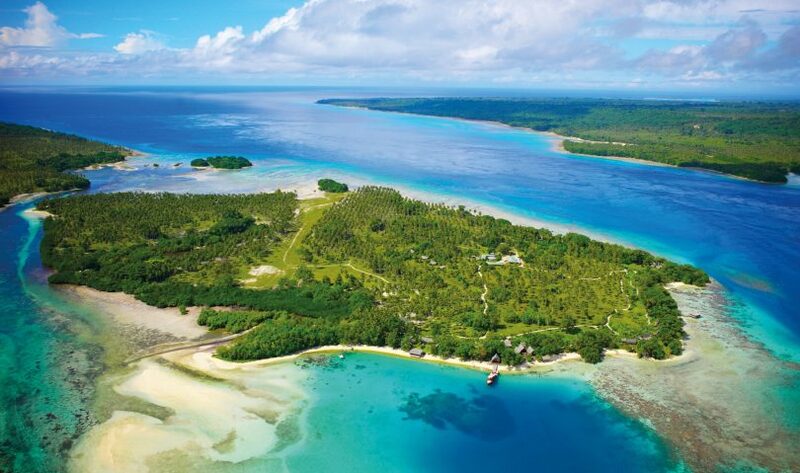 Take pleasure in Ratua’s one-of-a-kind activities; swim with horses, canoe to Malo blue hole, snorkel at the nearby colourful reef, watch sea turtles as they feed on sea grass, or simply sit back, relax and enjoy the serenity of the place. Fitness buffs’ may run,walk, or cycle around the 146-acre island, otherwise let out the wrangler in you and saddle up on horses and discover the island,the cowboy way. Travellers may also indulge at Ratua’s overwater Sunny’s Spa where various treatments are available to relax the body, mind and soul. Dining is exciting as the kitchen works with its own organic produce and from neighbouring islands along with fresh catch from local anglers.Complementing the food is a select wine hailed from the owner’s boutique winery in Southwest France. Whist secluded from the modern world,Ratua offers Wi-Fi connection at its Yacht Club – the social hub of the island. Rich cultural entertainments are offered in some nights in addition to the innate beauty of nature and starry skies that completes a magical stay in paradise.